Simon Spurrier is not the kind of comics creator who shies away from ambitious ideas. The recently wrapped Angelic sported pastel flying monkeys in an apocalyptic post-humans world, and Cry Havoc mixed monsters and myths informed by modern technology placed over the backdrop of Western colonialist warfare. So it’s not a huge surprise that Coda #1 (BOOM! Studios) is the start of a very big story. So far Coda has a lot in common with Ralph Bakshi’s 1977 film Wizards, both in its tone and color palette. This first issue opens with a disembodied voice stuck inside the skeleton of a massive animal, trying to tempt the protagonist to approach (and fall into) a trap that’s been set for him. The story that unfolds feels like classic high fantasy with a very dirty underbelly, the kind of adventure that would feel familiar to fans of not just Wizards but also Lloyd Alexander or N. K. Jemisin’s Broken Earth series. The protagonist is competent and misanthropic in equal turns, cynical not because it makes him cool but because he’s exhausted by the things he’s seen and done. As the story unfolds and the world comes into focus, it’s clear that Coda takes place in a sort of post-apocalypse of its own, where magic and technology co-exist and people have organized into city-states that lean toward lawlessness. 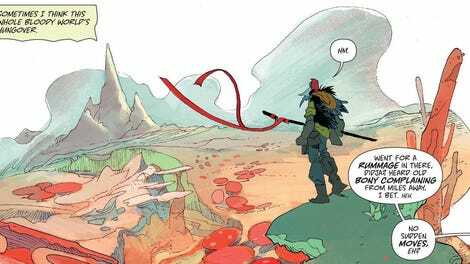 As wild and wonderful as Spurrier’s imagination makes Coda, it would be impossible for the comic to be as arresting as it is without the art of Matías Bergara (Sons Of Anarchy, Cannibal). His work for this book feels expansive and explosive in a new way. There’s a flexibility to some of the page elements that makes scale hard to judge and turns static images kinetic, leaving the protagonist’s vicious mount looking like it’s about to leap off the page. While the backgrounds are grand and sometimes overwhelming, it’s the character design that really gets Coda up and running. The main character’s flat affect slides into moments of incredulity and slapstick that provide some of the best comedic beats in the issue, and the monsters that inhabit his world are in some cases far more interesting than the people. There’s a bloodthirsty unicorn that looks as if it smells terrible, and things that might be bears but don’t have faces, little details that give personality to the made-up world in ways that a lot of comics fail to do with real-life locales. Bergara not only drew the entire issue, but he also did most of the colors himself, with help from Michael Doig. Particularly on the pages that feature violence, an explosion or a physical altercation, there’s a mixture of muted, faded colors and brighter jewel tones that make everything feel layered and vibrant. This issue ends on one of the better cliffhangers in recent memory, a single page that answers a couple of questions and lays out several more. That Spurrier and Bergara have managed to build a deep world that has a lot of history without losing readers is a testament to their skill; that they’ve also managed to create a main character who’s clearly aware of the tropes around grumpy solo explorers with tragic backstories without falling into the traps that the tropes set is remarkable (there are several similar comics coming out that have failed on both counts). If Spurrier and Bergara continue on this trend, they’ll be making something great.